A gay author from Illinois published the second book of his LGBTQ-themed family and romance series. 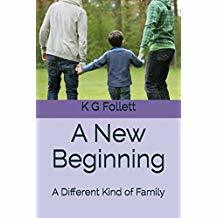 Just less than a month after publishing the first book of A Different Kind of Family trilogy, K G Follett soon followed up with book two, A New Beginning. The second installment narrates the life of Brad Kelly from late 1990 up to 1996. A New Beginning continues where the prologue of The Awakening, the first book, leaves off. Brad, already advanced in years, notices a picture he keeps in the bathroom of himself and Randy. The picture is taken over two and a half decades ago in front of the house he occupies now – the house that Randy, a senior architect, had designed for Brad. The story then shifts to late 1992. Brad, then a certified nursing assistant (CNA) at a nursing home, receives news of Randy’s death in a vehicular accident. Randy’s parents, never acknowledging their son’s sexuality or his relationship with Brad, claim their son’s body and arrange the funeral. Brad attends the funeral with his friends. Sue, Randy’s sister and the only family member to acknowledge Brad, approaches him. The story then follows Brad’s life for the next few years after Randy’s death. Brad juggles between work and nursing studies and fights a legal battle with Randy’s parents over their late son’s estate while struggling with grief, fear, and loneliness. Later, Ted, a young workmate, comes into his life to fill the void left by Randy’s death. What follows next is a series of momentous events that mark A New Beginning for Brad. K G Follett’s The Awakening: A Different Kind of Family (book one) and Love Matters: A Different Kind of Family (book three) complete the trilogy. He is also the author of The Bears’ Den series: The Bears’ Den: Frankie & Josh, The Bears’ Den: Jacob Makes Three, and The Bears’ Den: Transformations. K. G. (Ken) Follett has lived in Rockford, Illinois for over thirty years. He has worked in marketing, banking, nursing and education during that time. He now lives with and is happily married to his partner of nearly twenty years. Follett started writing “A Different Kind of Family” in the mid-1990s when the term “family” was being hijacked by various socio-political groups to be used against LGBTQ+ and other “alternative” family structures. This series of books is his attempt to reclaim that term to be used legitimately for ANY kind of family in today’s society, AND to shed light on what we could lose if we do not remain vigilant in these tumultuous times.